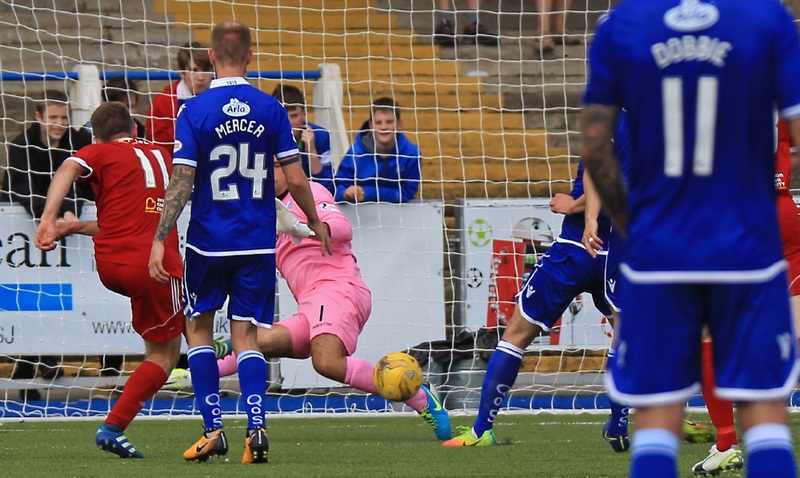 Queens failed to progress to the knockout stages of this seasons Betfred cup competition after they shared four goals in their final game in the group against Albion Rovers at a sparsely populated Palmerston. With only a very slim chance of going further in the competition, Queens knew that a win over group leaders Albion was needed if their faint hopes were to remain alive but although they rallied after a disappointing first half, where for the most part Queens played second fiddle to a well organised and confident visiting team, a share of the spoils was about the right result. Queens did have the benefit of winning the penalty shoot-out that followed, although in the end that counted for nothing. After last week`s game at Hamilton, Queens made two changes to their starting line-up with Derek Lyle, and Callum Tapping replacing John Rankin, and Connor Murray, and as usual a 4-4-2 formation was the preferred formation. 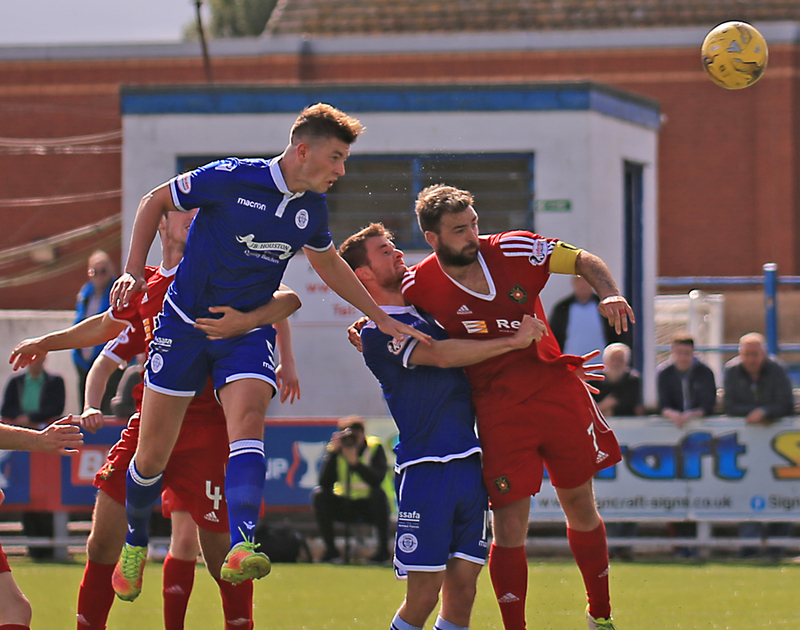 Captain for the day, Stephen Dobbie, led the side as he made his 150th appearance and it was his shot following a flick on by Lyndon Dykes that saw visiting `keeper Bowman called into action to make an early save. The home side went close again minutes later following a free-kick. Jordan Marshall`s progress down the left was halted unfairly, and from Dobbie`s excellent delivery Lyle`s powerful header was palmed away for a corner by the Albion `keeper. That bright start should have been the key to see the home side continue their dominance, but slowly the visitors worked themselves into the game and their calmness and inventiveness on the ball began to pose problems for Queens who spent quite a lot of the opening spell on the back foot. A neat passing move that began at the back and eventually progressed through midfield saw Albion win a free-kick some 25-yards from goal, and although former Queens skipper, Scott McLaughlin got his shot on target, it lacked the power to really test Alan Martin who collected the ball comfortably. It was easy to see how Albion had managed to score so many goals in recent games, and their style of football was easy on the eye as they constantly produced some good quality attacking play prompted in midfield by the impressive Michael Hopkins, and it was his speculative effort from distance that was only inches away from giving the visiting side what would have been a deserved lead - his shot beating Martin but crashing against the upright. In contrast to the precise, calculated build up play from Albion, Queens were very rushed with most of their play and this was clearly allowing the early phases of frustration to creep in and when a cross from Lyle was blocked rather luckily into the path of Dobbie the anguish was on show as his snap shot ended well off target. There had been warnings during the previous 10 minutes or so that the visitors certainly had it in them to trouble Queens, and on 38 minutes they not unexpectedly went in front with a well taken goal. Neat passing took them to the edge of the area and when it looked as though the move had collapsed, Trouten displayed good skill to retain the ball, move into the area and turn past two defenders before placing a precise low drive past Martin which gave the away side a real boost just ahead of the break. You could hardly argue with scoreline, but once again Queens did create scoring opportunities and the half-time team talk could well have been different had the chances have been taken, but as it was, Queens reached the break for the fourth game in a row without being able to find the net. Queens made a change at the break with John Rankin replacing Andy Stirling, and their was also a change in formation as they switched to a 4-3-3 set-up with Lyndon Dykes spearheading the attack. The home side made a better start to the second period and an early free-kick whipped in by Dobbie began a spell of strong Queens pressure as they forced a series of corners in quick succession, and from the second of these Kyle Jacobs - under pressure from his own team-mate - could only steer his header wide of the far post. The midfielder was in the action again as Queens launched a quick break down the left. Tapping, Marshall and then Dobbie combined well to put Jacobs in, but his shot from the right side of the 6-yard box was blocked away. The tempo was a lot quicker from Queens, and for once in the game, Albion were struggling to get out of their own half, although on one occasion their movement was swiftly halted when Scott Mercer`s challenge saw him become the first player to see a yellow card shown in his direction. The hosts went to their bench for the second time after 63 minutes when Connor Murray replaced Callum Tapping, and within a minute of the change, Queens were level. There seemed to be little danger when the ball broke in Queens favour just outside the box, but after instant control, a quick look up and a thunderous drive from Stephen Dobbie the ball was nestling in the back of the Albion net. The goal was typically `Dobbiesque` and a fitting tribute to mark the 150th appearance of his Queens career. 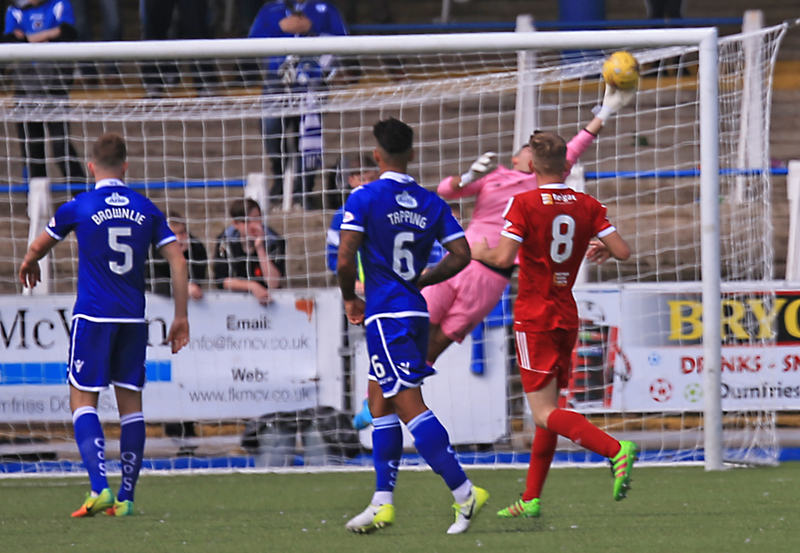 This was certainly Queens` best spell of the game, and once again from a corner they went close to taking the lead this time it was Callum Fordyce who was just not able to keep his header on target. With 12 minutes to go, Danny Carmichael replaced Lyle for his seasonal debut, and just as the previous substitute heralded a goal, so did this one, but unfortunately for the majority of the crowd of 1002, it came for the visitors. After winning a corner, Albion were awarded a spot-kick when the unfortunate Mercer attempted to head the set-piece delivery clear but in doing so he got in a tangle and the ball struck his raised hand to concede the penalty. The scorer of the first goal of the game, Trouten, stepped up to convert the perfect penalty and once again give the visitors the lead. Probably aware that they needed another goal to progress, Albion continued to push forward and it was probably doing that that led to them conceding again. 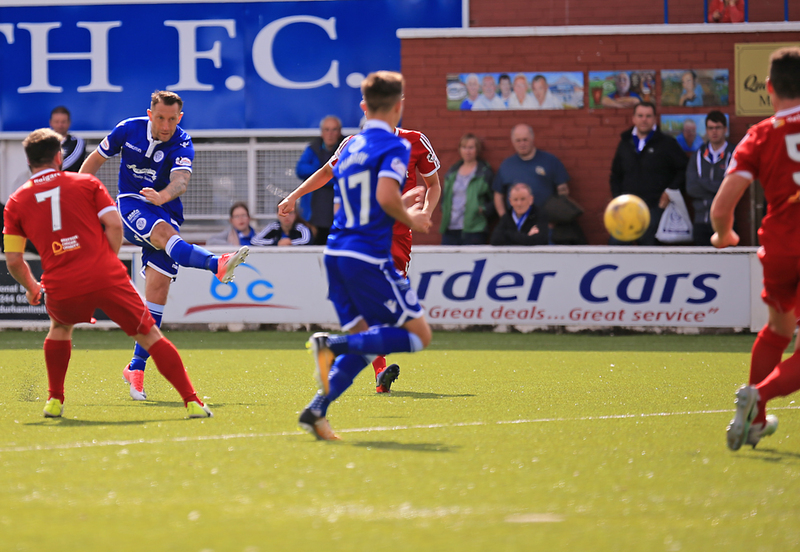 With only 5 minutes to go Queens finally made one of their corner routines work as Darren Brownlie was given the freedom of the penalty area to plant a powerful header past Bowman following Carmichael`s pinpoint delivery. The goal was only the big defenders 2nd Queens goal and raised the hopes that a win was still on the cards. With a penalty shoot-out that nobody wanted looming large Queens had two chances late on to claim all 3 points, and both fell to the player who is most likely - Stephen Dobbie. A quick break down the left by Marshall saw him slip a well weighted pass inside the box to Dobbie who in one quick movement got his shot away but Bowman got down low to hold on, and then in the dying seconds following a foul on Carmichael, the striker was a little too ambitious from fully 35-yards out as his free-kick flew high into the Portland Drive terracing. 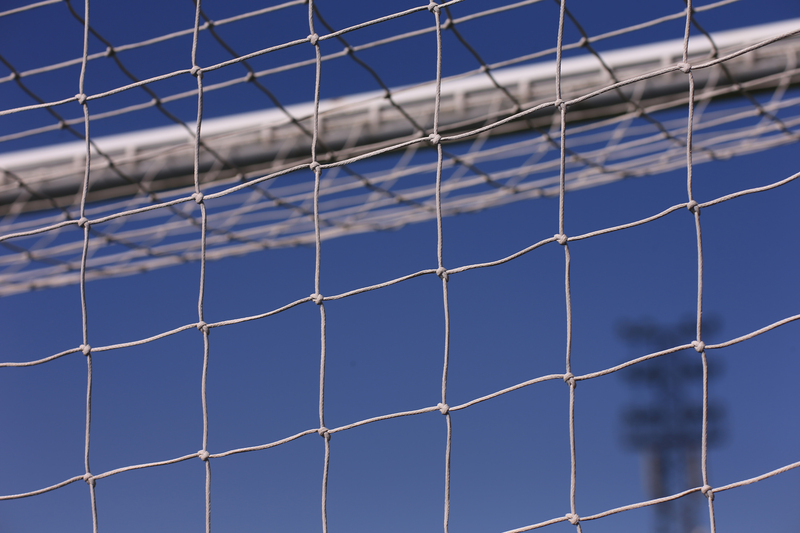 The 3 minutes of injury time brought no further action and so for the third Queens game in a row it went to a shoot-out. Queens went first and Dobbie scored, McLaughlin levelled it up. Connor Murray, and then Higgins scored to make it 2-2. 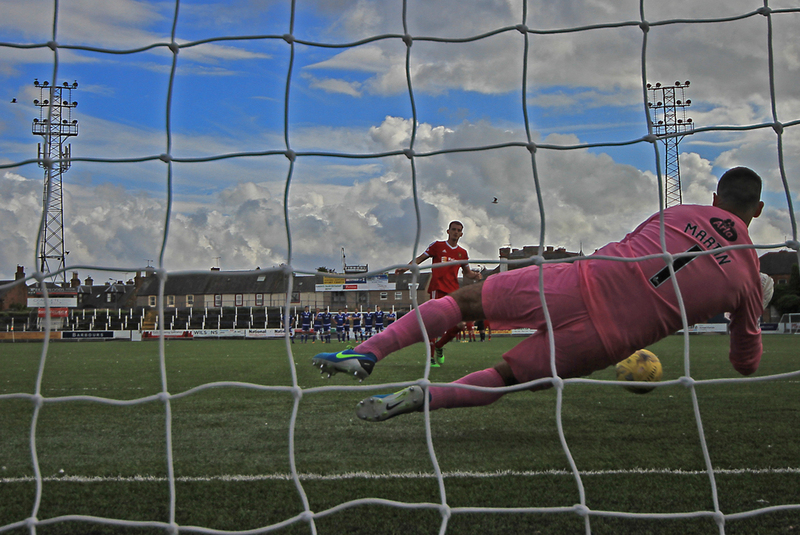 Danny Carmichael, and then Davidson both had their penalties saved, then Callum Fordyce gave Queens the advantage. Trouten then levelled. Kyle Jacobs finished with composure and watched as Alan Martin saved from Fisher to give Queens the extra point. So Queens end the Betfred campaign unbeaten but unfortunately this season we won`t be progressing to the knockout stage. 14:49 Albion xi; Bowman, Reid, McLaughlin, Lightbody, Perry, Holmes, Fisher, Davidson, Shields, Hopkins, Trouten. 14:50 Today is must win for the Doonhamers if they are to have any chance of qualifying from Group G.
14:50 The man in the middle today is Scott Millar assisted by Frank Connor and Stephen Mitchell. 6 min Tapping wires a superb ball for Dykes but he can`t get enough on it. 9 min Mercer`s delivery from the right is caught by Bowman. 13 min Lyle header is tipped out for a corner by Bowman. 23 min McLaughlin`s free-kick is well held by Martin. 31 min Hopkins shot cracks of the bar. 40 min Trouten rounds off a great individual move by slotting the ball past Martin. Half Time Queens simply haven`t been good enough in the first half. Alan Trouten`s great goal gives League One Albion the lead. Half Time Attendance today is 1002. Half Time John Rankin replaces Andy Stirling for the second half. 46 min Dobbie`s free-kick is headed out for a corner. 47 min After nice build-up, Dobbie`s shot is deflected out for a corner. 48 min Jacobs heads wide from the corner. 52 min Jacobs` shot is blocked out for a corner. 63 min Dobbie turns his marker and fires an unbelievable strike past Bowman. 1-1. 65 min Queens look much in this second half. Putting the Albion defence under some intense pressure. 77 min Rankin`s cross-come-shot goes wide. 81 min The referee points to the spot after Mercer handles in the area. 83 min Fisher knocks the ball out for a Queens corner. 85 min Dobbie swings in a dangerous ball into the box but is out for a corner. 86 min Brownlie heads home from the resulting corner. 2-2. 90 min Dobbie`s shot is saved by Bowman. 90+1 min Marr cautioned for an awful foul on Carmichael. 90+2 min Dobbie fires over the bar from long range. Look like we`re heading to a penalty shoot-out for the third game in a row. 16:52 Dobbie sends the keeper the wrong way to make it 1-0 in the shootout. 16:53 Ex-Queens midfielder Scott McLaughlin levels the shootout 1-1. 16:53 Queens regain the lead through Murray 2-1. 16:54 Higgins goes straight down the middle 2-2. 16:54 Carmichael`s poor penalty is saved by Bowman. 16:55 Martin saves Davidson`s penalty. 16:55 Fordyce gives Queens the lead again. 16:55 Trouten makes it 3-3. 16:56 Jacobs send Bowman the wrong way 4-3. 16:57 Martin saves Fisher`s penalty kick. Queens get the bonus point but can`t qualify to the latter stages.